Your job is at risk—if not now, then soon. We are on the leading edge of a Smart Machine Age led by artificial intelligence that will be as transformative for us as the Industrial Revolution was for our ancestors. Smart machines will take over millions of jobs in manufacturing, office work, the service sector, the professions, you name it. Not only can they know more data and analyze it faster than any mere human, say Edward Hess and Katherine Ludwig, but smart machines are free of the emotional, psychological, and cultural baggage that so often mars human thinking. So we can't beat 'em and we can't join 'em. To stay relevant, we have to play a different game. Hess and Ludwig offer us that game plan. We need to excel at critical, creative, and innovative thinking and at genuinely engaging with others—things machines can't do well. The key is to change our definition of what it means to be smart. Hess and Ludwig call it being NewSmart. In this extraordinarily timely book, they offer detailed guidance for developing NewSmart attitudes and four critical behaviors that will help us adapt to the new reality. The crucial mindset underlying NewSmart is humility—not self-effacement but an accurate self-appraisal: acknowledging you can't have all the answers, remaining open to new ideas, and committing yourself to lifelong learning. 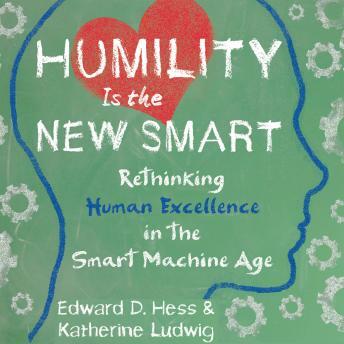 Drawing on extensive multidisciplinary research, Hess and Ludwig emphasize that the key to success in this new era is not to be more like the machines but to excel at the best of what makes us human.